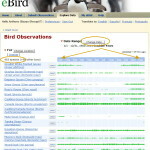 If Shorebirds are of interest be sure to view this page that offers Low and High tide information. The XTide Master Index – when visiting this site, perform a CTRL + F on the PC or a Command + F (I believe) on a Mac, a find box will appear in the lower left hand corner of this web site (see image below which illustrates this). 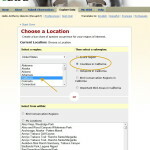 There you can search by specific shore line areas. 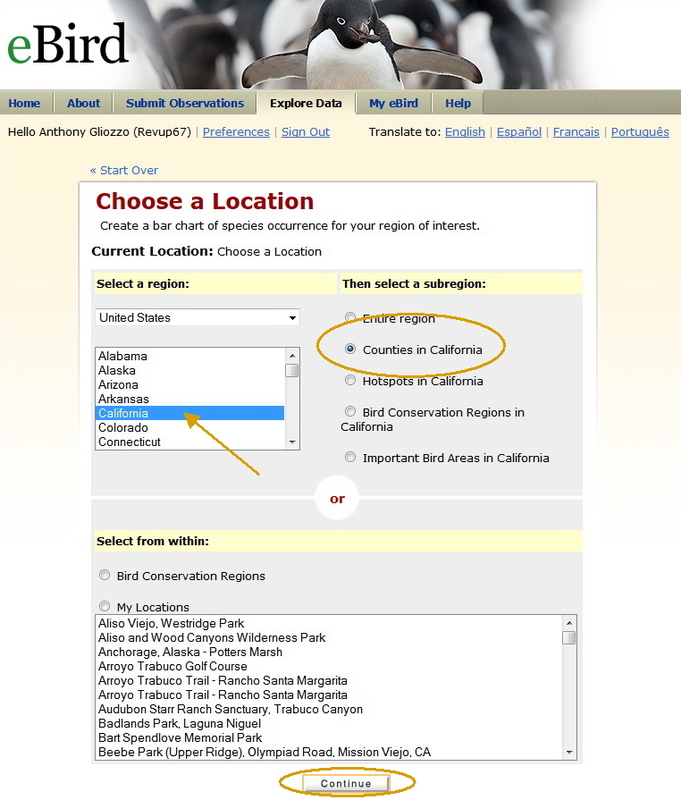 For instance, I can type in San Clemente and the San Clemente Index comes up for southern California as shown in the xample image below. (Note – not all shore line areas are included such as Dana Point). When searching Dana Point, no index is found thus San Clemente would be the next closest point. Once you find your location, note the Low Tide times for the day. There are typically two. During low tide shorebirds enjoy foraging and this may be your best opportunity to not only view a larger amount of shorebirds in that area, but also view the shorebirds at a closer distance. Here’s a screen capture of a search I performed on 8-18-2014. I’ve broken the page in 2 sections for a more concise understanding with markups. Trying to determine a Bird ID? 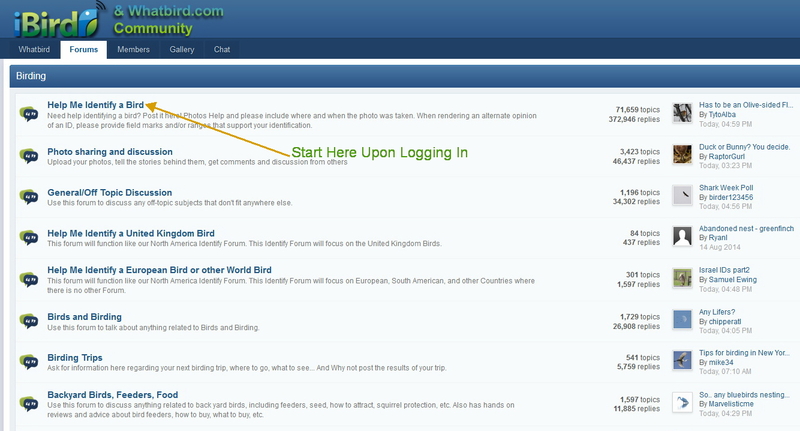 There’s a forum at WhatBird.com – once at this site,click the Forum tab which can be found on the upper navigation bar (sample images below). You’ll need to create a login if you don’t already have one. Once that’s done you can share your images within this group. Please read the Forum’s FAQ before posting to become familiar with the rules and guidelines. 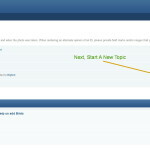 Of special note is once you are about to post a New Topic, don’t upload directly from your computer to your New Topic. 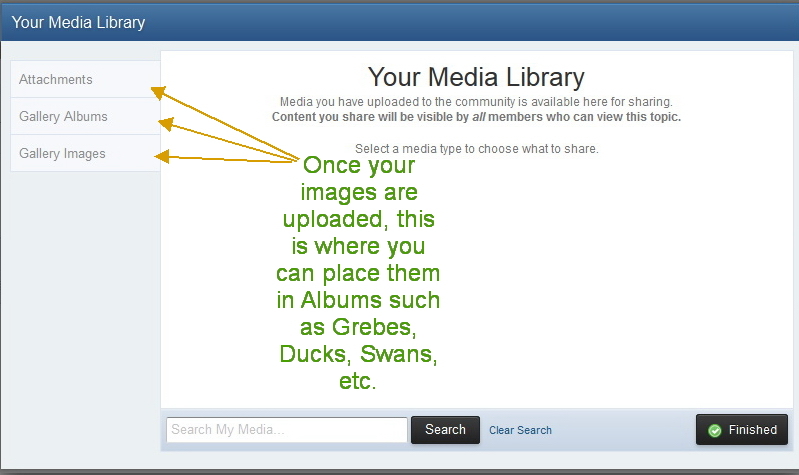 Instead, Add your images to the Media section of your account. 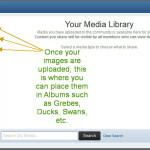 Then from your New Topic, choose the My Media icon and select your images from there. The reason for this is an individual total upload limitation of a measly 2Megabyte that is set for individual image uploads. 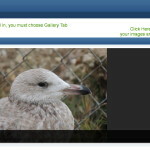 Choosing from your Gallery via the My Media icon offers more storage space. This group is dedicated to bird sightings, photos, and postings of birds located within the Orange County California region. To access this Yahoo Group directly click Here. Please read the Group rules prior to posting. This group is somewhat strict and they ban posters for not following the guideliness. 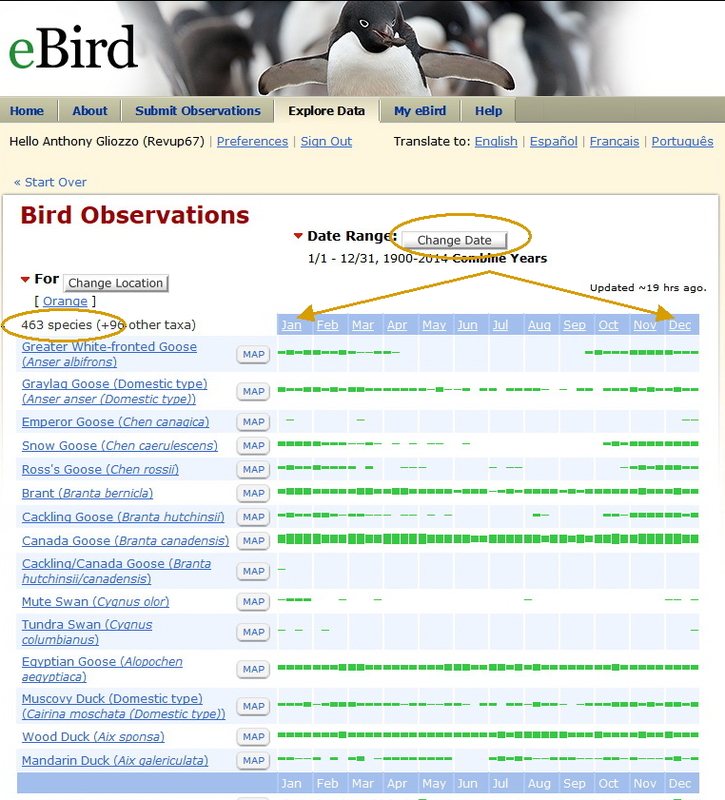 Summary: On a daily basis thousands of eBird subscribers across the world (either through the main web page or through the Birdlog app for Android and Apple iOS phones) enter in important field data. 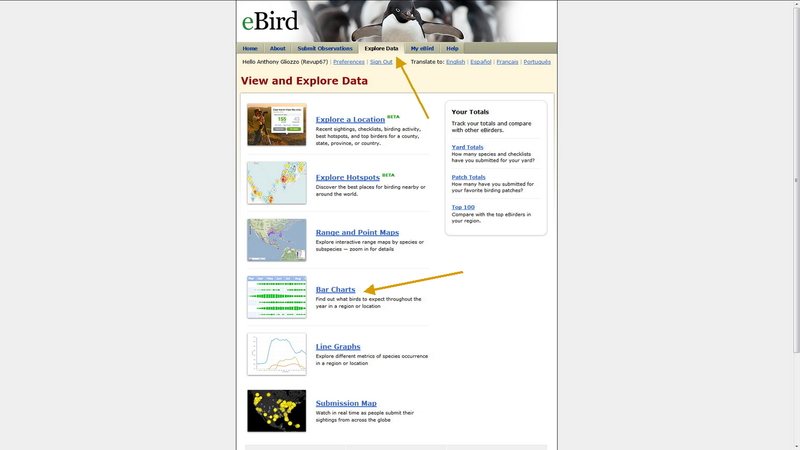 The eBird web site offers a variety of tools to slice and dice the data in ways that may be useful for your next bird outing. 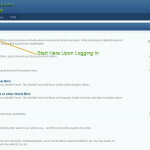 Like many web sites, a Login needs to be created before accessing such information can be made accessible. 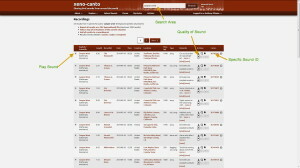 One example of this is the Explore Data tab which you’ll find upon logging in. 1. 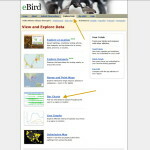 On this initial screen for Explore Data choose “Bar Charts”. 2. Once in Bar Charts choose your State and County and click Continue. 4. This is perhaps the most critical screen for several reasons. 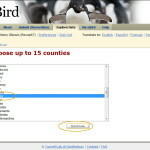 Once you find the bird you are looking for (search using CTRL+F for PC or MAC Command+F), its easy to tell if that particular bird will be seen during a particular month in your county. 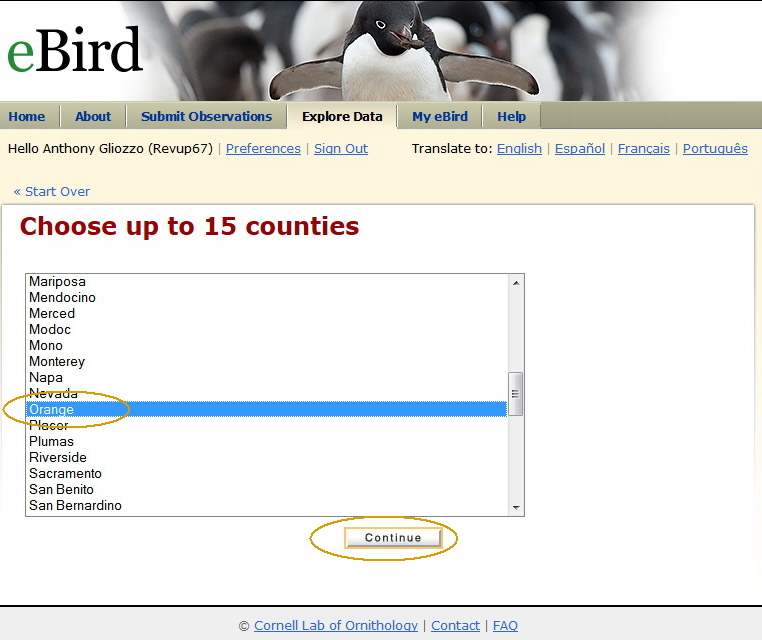 As an example, on this screen capture, I’m not likely to see a Greater White-fronted Goose from the middle of April through the middle of September. If I believe I’ve spotted one I should have a minimum of 2-3 positive ID points to indicate I have found this particular Goose. 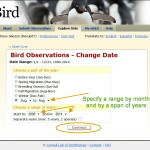 Sometimes choosing the Change Date button on top is most helpful as some birds are likely to return several years in a row. A 5 year span can offer more specific plausible data vs. using the standard default date from 1900-present year. Lastly, try clicking the Map button and a map will appear of all the locations your particular species was seen during the chosen time span within your county. From there, look for any red markers as your chances are possibility better at that pin pointed location than other blue pointed markers. 5. 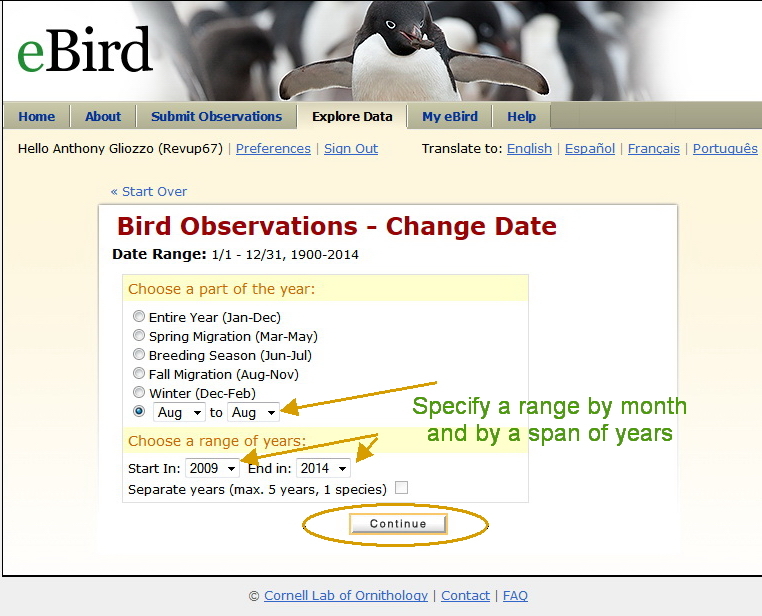 On this final screen you’re able to sort further by specifying a particular date range such as between any given month or months or by choosing the pre-defined critera such as breeding season. Breeding season can be key as plumages change for one. Birds molt in and out of plumages between basic and breeding plumages As another example with autumn approaching in about a month, I may opt to explore what will be migrating through our local area in advance.